Makeup and Beauty Treasure: Celebrating Fab Mom weekend at The Nature’s Co. Celebrating Fab Mom weekend at The Nature’s Co. Celebrating the strength and beauty that all Mothers exude & saluting the selfless spirit of Motherhood, The Nature’s Co. invites you to join them for a special mother - daughter/son event in the exclusive TNC style from the 9th of May - 12th of May. 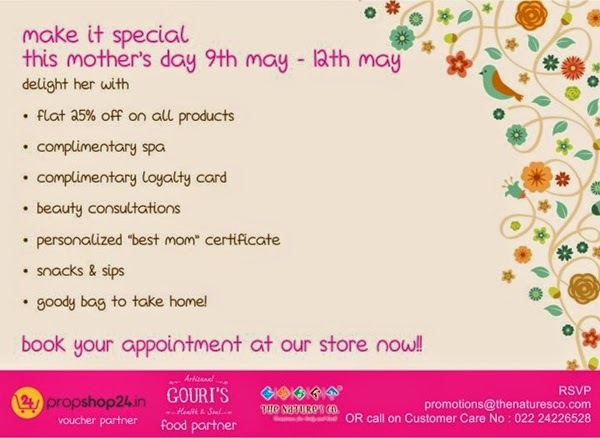 You are cordially invited along with your mom, to pamper her with an experience she will never forget! The celebratory plans on this special time include four days of Flat 25% off on all products (and 35% off using discount code MSTNC14), a complimentary spa of her choice, complimentary Loyalty Card, beauty consultations from TNC experts, a personalized "Best Mom" certificate light bites exclusively from Gouri's Health & Soul, and a Goody Bag for her to take home along with a little surprise from Propshop24.com. Book your appointment for your mother and you at any of our stores. Call 022-24226528 or email at promotions@thenaturesco.com.